In the 69th issue of the Bed and Breakfast E-Traveller, we take you to Ottawa, Ontario. The Association of Ottawa Bed and Breakfasts invites you to stay with us and enjoy the delights of our nation’s Capital. Our beautiful city offers much to engage visitors’ interests, from late Fall to early Spring. 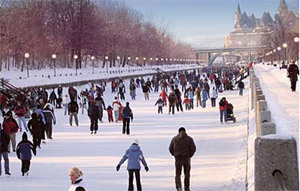 Surrounding our locations are extraordinary monuments to nature and human endeavour: The historic Rideau Canal, built between 1826 and 1832, becomes the world’s longest skating rink in the winter months and the centre of activities for the world’s largest family winter festival in February – Winterlude. Thousands of acres of the Gatineau Hills offer opportunities for both downhill and cross-county skiing as well as wonderful eateries and concerts in Wakefield, Quebec. Ottawa’s cultural venues such as the National Arts Centre, the new Irving Greenberg Theatre Centre and Arts Court provide a cornucopia of live music, dance and drama (of course there is always Parliament Hill if you really need drama!) The Ottawa Senators, last season’s NHL Eastern Conference Champions, thrill crowds at Scotiabank Place – a short 15 minute drive from our members’ locations. All await exploration and discovery. With its fiery history, the Parliament Buildings, and the newly restored library and Peace Tower are an architectural celebration of Canada, complemented by the Museum of Civilization, the National Gallery of Canada and the recently opened Canadian War Museum. These form the nucleus of Canada’s world class museums, all within walking distance or a short bus ride from our members’ locations. Three special events mark the cooler months in Canada’s Capital. In early December, millions of twinkling coloured lights are turned on throughout the downtown area. Ottawa is the focal point of a nationwide co-operative effort to illuminate the country from sea to sea to sea. We are certainly doing our part! 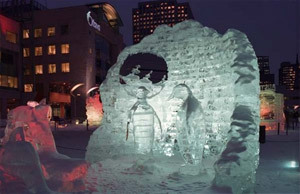 The second event is Winterlude which runs the month of February, with special events clustered on the weekends. Skate on the Rideau Canal, taste a Beavertail, marvel at a park-full of glittering ice sculptures, and be a kid again in an amazing childrens’ park made of snow! And the third? Well, maple syrup production of course! And for skiers, there’s alpine skiing, as well as over 100 km of groomed trails across the Ottawa River in Gatineau, which hosts the Ski Marathon and the Keskinada Loppet every year. Ottawa’s restaurants and stores cater to visitors’ every whim and taste. In the historic Byward Market alone, there are over 60 choices of restaurants and entertainment venues. Other neighbourhoods such as Sandy Hill, the Glebe and Old Ottawa South offer unique shopping and dining experiences. Time and again our guests from around the world tell us that they need to come back and continue their exploration of our clean, safe, beautiful and exciting capital city, as their first visit just wasn’t long enough. Business visitors are equally well served in our establishments. We are close to downtown offices and embassies and some of our members are located convenient distances from the train and bus stations, as well as the airport. We all offer a quiet work environment, flexible breakfast options and many have in-room work spaces and complimentary wireless internet. Your first step in planning your visit is to contact our members and you will find that our professional hosts will assist you from the first contact through to the last cup of coffee! We wish you a wonderful visit to the most beautiful and safest capital city in North America . Images provided by the Association of Ottawa Bed and Breakfasts.